The new Husky 52 in. Industrial 9-Drawer Roller Cabinet has arrived. This cabinet is great for storing and organizing all your tools. The cabinet is made from high grade all welded 18-Gauge steel construction and finished with tough industrial textured black powder coat paint. 9 Drawers provide a total of 22,636 cu. in. storage capacity. Drawers are all rated for 120 lb. each and are equipped with Soft Closing mechanism that ensures you never slam them closed. The extra-large bottom drawers have two sets of slides to hold your heavier items. Underneath this unit is a reinforced bottom panel with 6 Heavy-Duty 5 in. casters capable of supporting up to 2,500 lb. An ergonomic handle can be mounted on either side of the cabinet allowing one to move the unit with ease. Finally, this cabinet has an internal keyed locking system to keep all your tools and supplies safe and secure. 5 in. casters (2 stationary and 4 swivel with toe breaks) can support up to 2,500 lb. 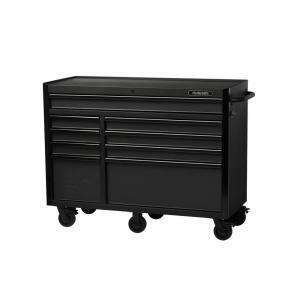 Tbook.com crawls the web to find the best prices and availability on Industrial Hardware and related Tools and Hardware products like Husky 52 inch 9-Drawer Industrial Roller Cabinet Tool Chest in Textured Finish. For this page, related items include products we find that match the following keywords: "Industrial" at our vendor partner Home Depot. Husky 52 inch 9-Drawer Industrial Roller Cabinet Tool Chest in Textured Finish is one of 143 Industrial Hardware and related products listed in the Tools and Hardware section of Tbook.com If you have any questions on this product, please give us a call at 734-971-1210 during the hours of 9am - 5pm EST for assistance. Thank you for shopping at Tbook.com, the Internet Department Store!